We woke to dry weather but the rain that had been forecast soon arrived,. It was very heavy rain. Over breakfast we decided to delay ride and shorten the route for when rain stopped, we also planned the evening meal, Suzanne and Christopher volunteered to go to local Tesco to buy food and drink for lunch. We sat and waited for rain to stop, the phone rang Christopher called to say now he had been out an about the rain looks set in for the day, suggested rather than staying in the caravan all day we should maybe go out to pub instead of cycling and let the kids go to wacky warehouse to burn off some energy. We agree to plan shorter route so over pizza, Colin and Lee examine the maps, luckily Colin had bought Ordnance survey maps of the area so we were able to plan our own route rather than stick to the limitations of Sustrans maps. 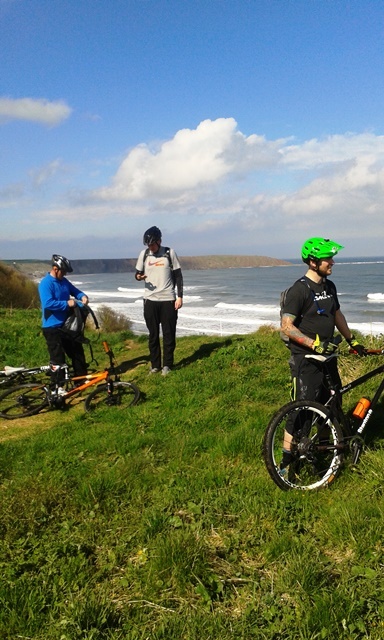 The OS maps show the Sustrans routes anyway, so we decided to try to get to Filey along the coast, then loop back round. 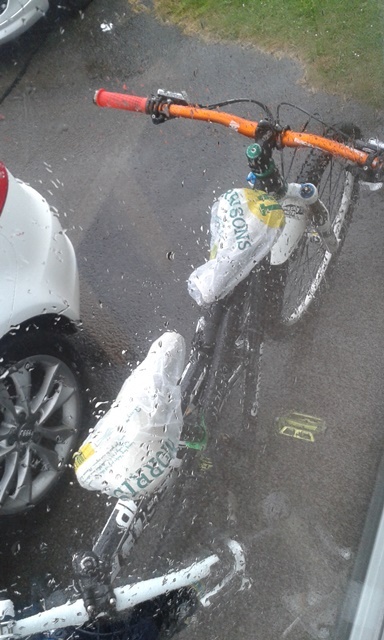 I know its not true Multidaymen style to duck the weather but when you are cycling a circular route you sometimes are tempted by the soft option. The rain stopped at 1.15. 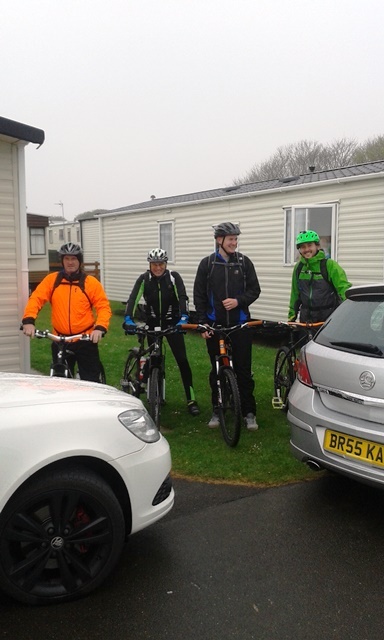 We put our gear on then the usual quick photo for the start of a ride before we head up the site to the cliff tops. Waterproofs on and ready for the off. 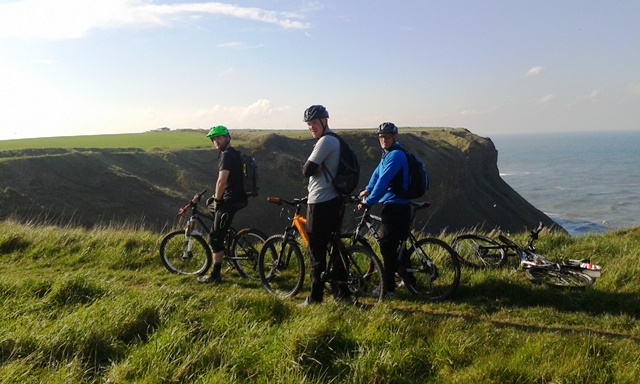 The cliff path looks slippy and muddy, we try to cycle it for a few yards but it is so slippy and uneven we are struggling to keep on our bikes and one slip would see us slide down 50 foot into the sea. We decide to avoid the path and drop back down through the site out towards Cayton Village, its the old road some of way and as we are cycling along it an old man stopped us and asked if we were in the race today, we politely tell him we are not racing but we don't tell him it was through that area two days before, wonder how long he sat waiting for the professional cyclists to ride through? 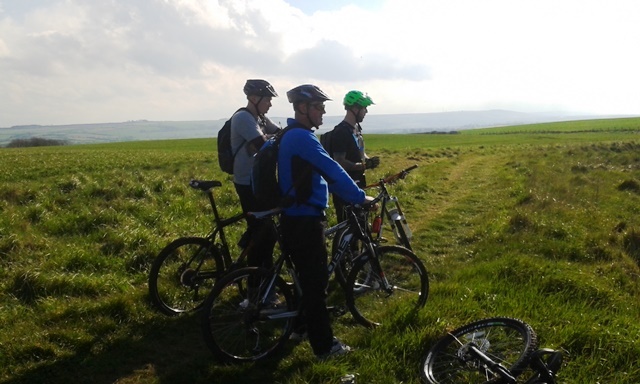 We take a left under the new main road through Cayton Village then drop onto NCN route1. We follow route 1 to Hunmanby. Its undulating we are also still on the route of the race as there are lots of bikes at the side of the road all painted yellow and blue, there is even an exercise bike out. 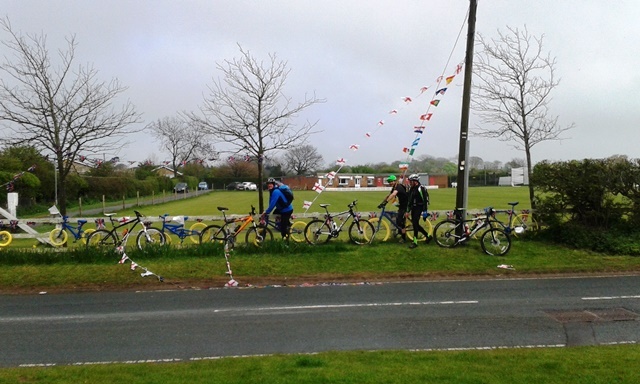 We stop at a fence where there is a long line of bikes out, Stephen checks the row in case there is one better than his but no, Colin nicks a flag as he often rides his holidays with a flag on his bike, something else that is becoming a bit of a tradition. Then the route crosses the main road and goes uphill. Up and up and up a very steep hill. We stop at top to peel a layer off the sun has come out and we are sweating but don't complain as the rain has stopped. The route goes along the top of the hill which is nice and flat, then we go down hill, its just as steep this side so we can rally really fast. Chris gets a nose bleed and has to stuff tissue in his nostrils for the next few miles, this of course means he has to breath through his mouth, so every so often you would hear him coughing and spitting as he swallowed another fly. Of course the route rejoins the road we had just left and I had the opportunity to drive that road a few weeks later and yes it is flat. Sustrans strike again. I must do a bit more map reading in future to see if there is a more sensible way than just blindly following the Sustrans route. We are now back on our own planned route and the plan is to take us out to Filey. This means checking the map at every junction to keep us right and in the right direction. 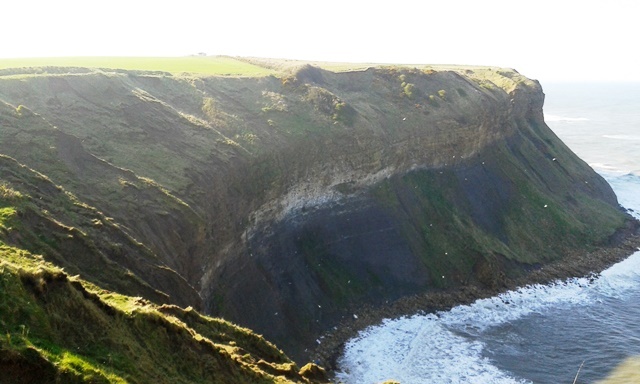 We eventually find the bridle path that leads out to the coast and the cliff tops. 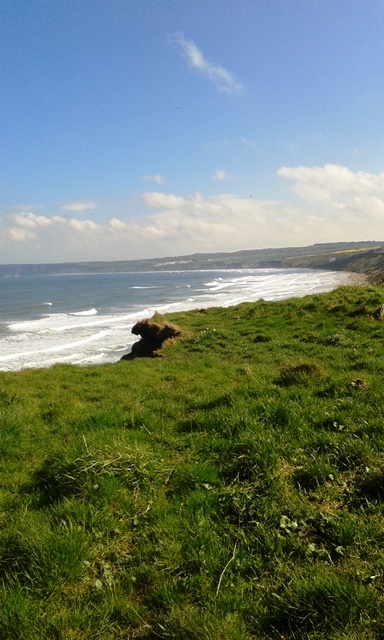 Our planned route goes through Filey We head along the cliff tops then have to go down some steps to reach the sea front. 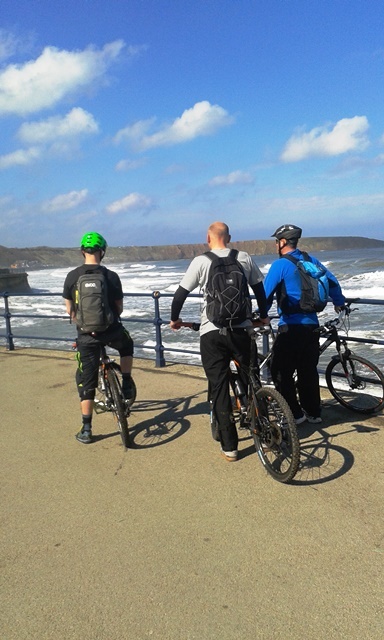 You can see the cliffs on the other side of the bay we cycle along the sea front then come to more steps, its an up this time up more steps to get back onto the cliff tops on the north side of Filey. This brings us to the Cleveland way which is a coastal path all the way back to Scarborough along the cliff tops, the path looked good so we decided to cycle it rather than go back out to the road. Just keep off the edge as its a long way down. It was definitely the right decision, fabulous route with amazing scenery. Still best to keep away from the edge. The caravan site came into view, we asked a dog walker if path was now passable they replied yes. We carry on along the cliff top, the path deteriates and is a bit slippy and muddy but we can see the entrance gate to the caravan site. 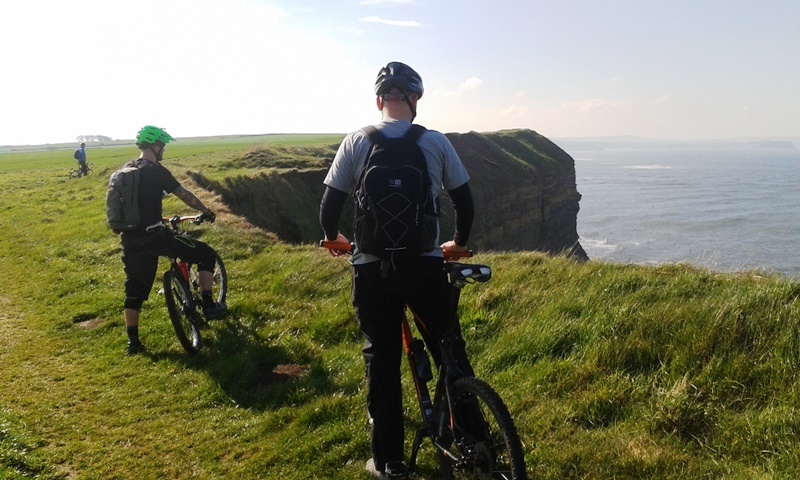 So although we are cycling close to the edge of the cliffs, we carry on and make it safely back onto the site. As we cycle through the gate there is the smell of a bbq, it makes us all feel very hungry. We think about having one for our evening meal. However as we arrive back at the caravan the sky looks very dark and then sure enough as we are having a shower and a change of clothes, thunder and lightning. We change our plans and decide to drive to the local pub instead. We go in and ask for 8 carveries only to be told they had been really busy and were running short of food, we agreed to wait and see how it went, luckily we got the last servings as everyone after us was turned away. 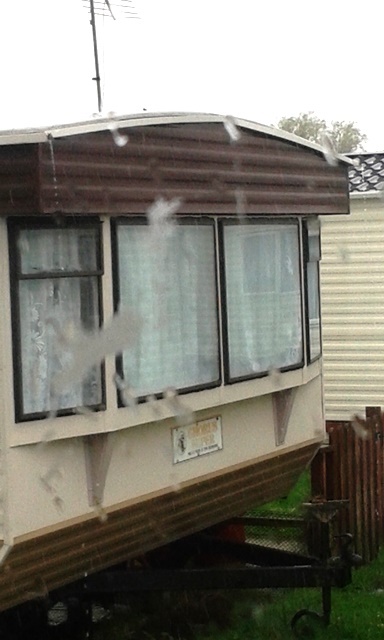 Glad we did as it was very nice and just at the bottom of the caravan site so saved having to drive miles in a thunderstorm.